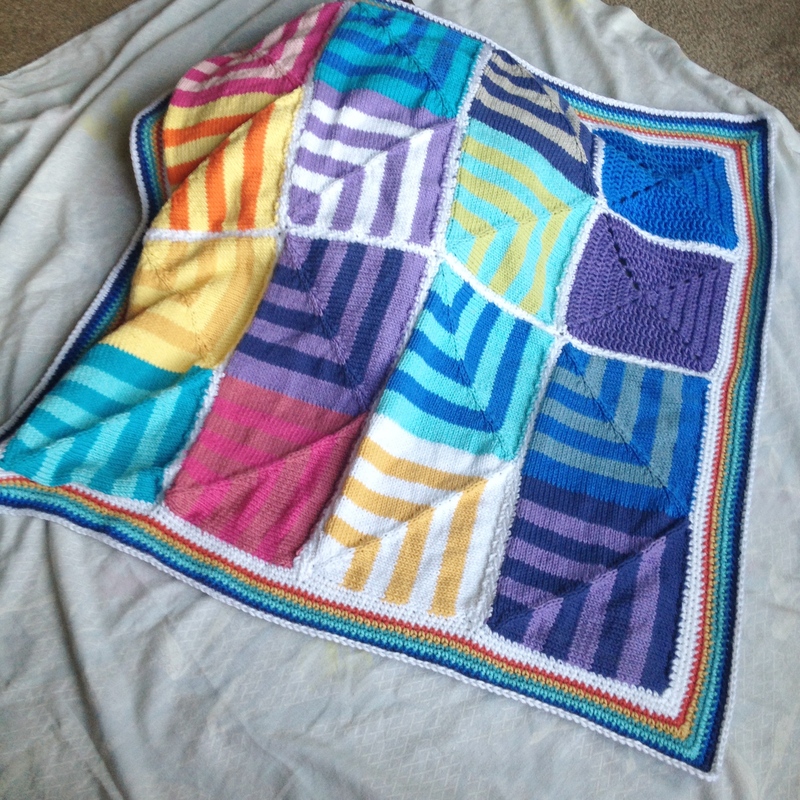 They are all 34″ square and an absolute dream… This blanket is very alive and is a true one-of-a-kind as I only had enough of those center squares to make 3 different pieces. The blanket in the picture sold in my Etsy Shop! 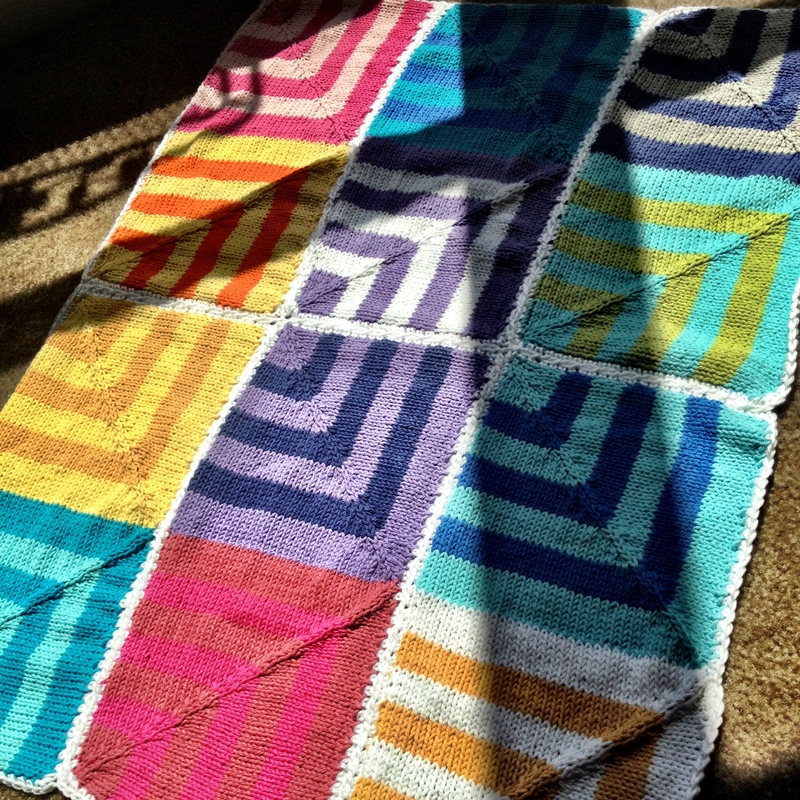 I knitted the mitered squares in 2007 from the stockinette stitch version of the Psychedelic Squares Blanket Pattern. 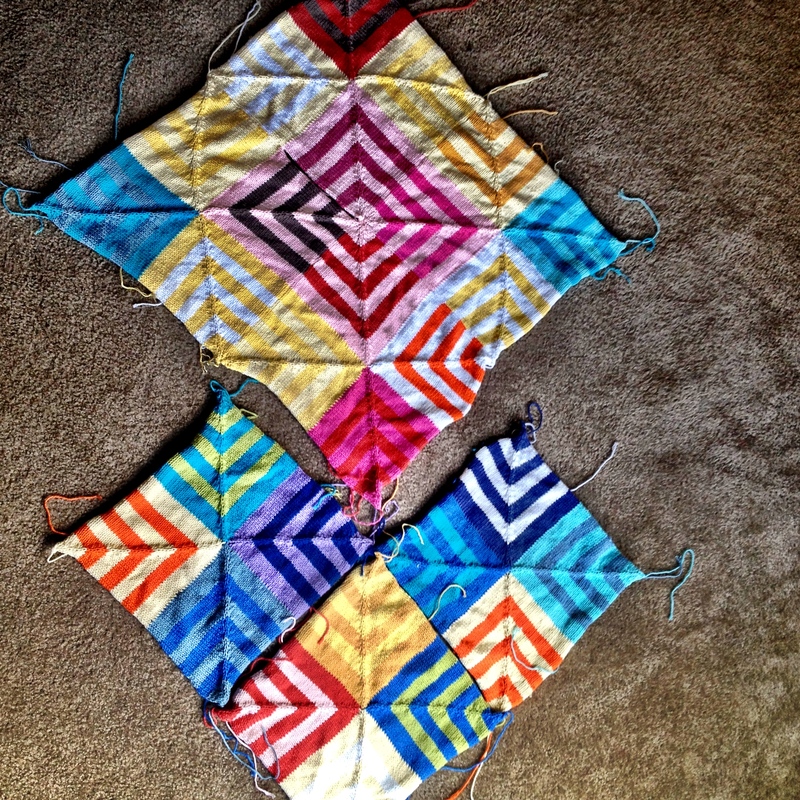 Of course, if you know anything about me, you know that I have a severe sewing allergy (you can read that as “I’m no good at it” – haha) and so I looked online for this tutorial on how to make the No-Sew Mitered Square Afghan. Unfortunately, this is from the archives of the Mason-Dixon knitting blog, so you have to scroll down a bit past halfway until you see the “Epic Tutorial” as she says – which is true! Flash forward to 2012. That’s how I found my old WIP… All knitted up and sewn together with mattress stitch, and ready for a border. BUT It wasn’t completely finished… Actually a couple of the squares had live stitches on circular needles, and I had really forgotten how to knit by this point. I took a whole day to pick out all of my woven ends and mattress seams, and I had squares like in the *blurry* photo above. There was a strip missing from this configuration, so I improvised with a couple of crochet squares. Not half bad! 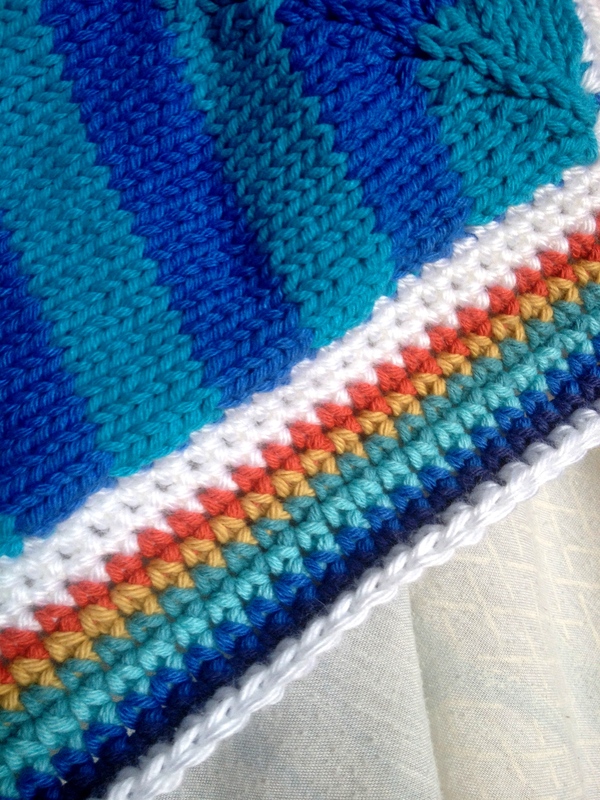 A fun SC border adds a nice touch, and this blanket kind of has a parachute feel with the “pockets” of knitted squares. I really enjoy the mixed textures. Sneak peek below of the other squares for the next two blankets. 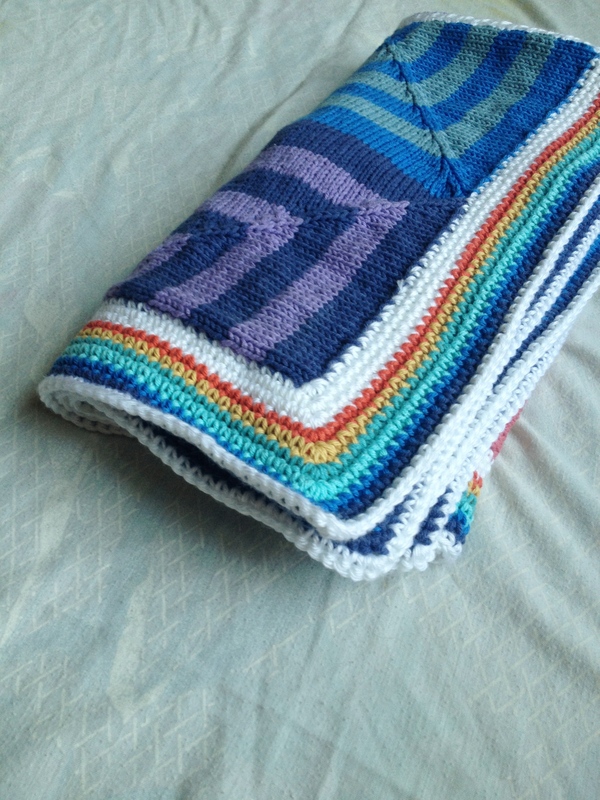 The missing quarter of the lower blanket does exist – it’s in my WIP basket! Posted in California DreamingTagged Crochet, Mitered Square, Motif, PLT join, Rainbow, Squares, StripesBookmark the permalink. 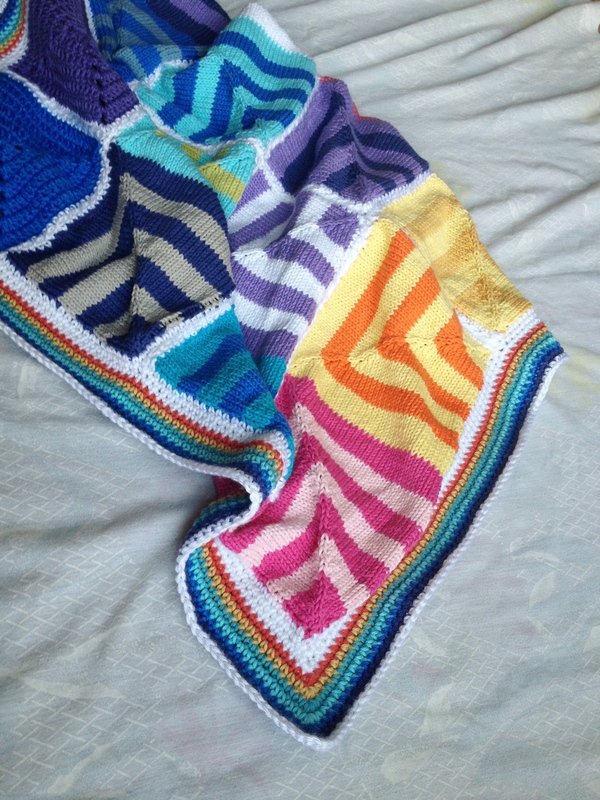 Love this blanket, the set of the pattern is so unusual.